It’s obvious that a number of the industry giants are being a little radical in their (new) designs for #ISE2018 this year. 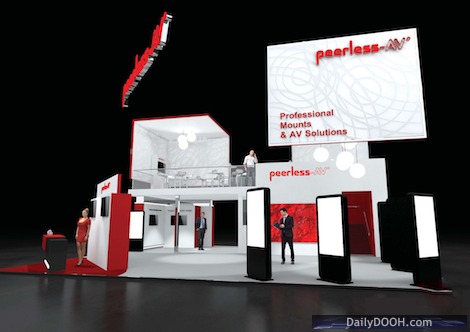 One stand design that we really like is Peerless-AV who will be in Hall 12, F90, with a two-storey construction. They’ll be exhibiting a wide range of Kiosk Solutions, including the KIPICT555 Fully-integrated Interactive Kiosk, LED Mounting Systems, Digital Signage Mounts, Outdoor Displays and more! This entry was posted on Monday, January 29th, 2018 at 15:51 @702 and is filed under Scuttlebut. You can follow any responses to this entry through the RSS 2.0 feed. You can leave a response, or trackback from your own site.